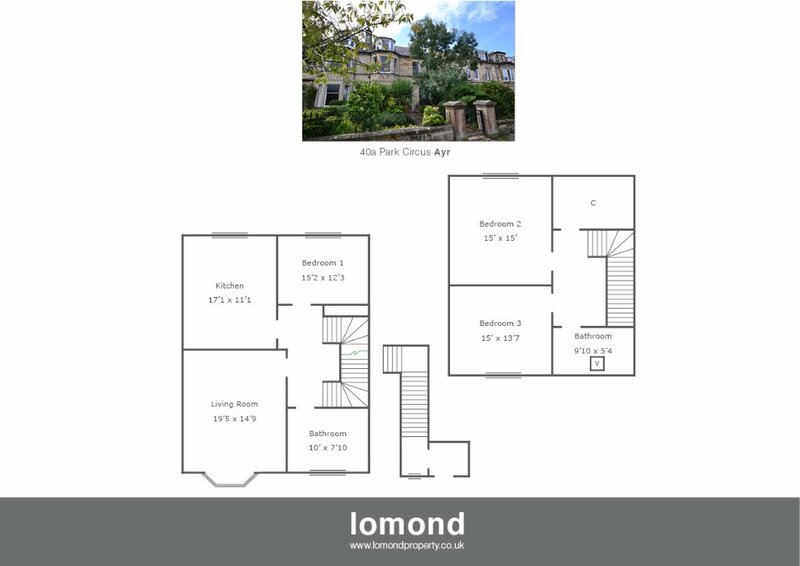 Located in one Ayr’s most sought after areas, 40a Park Circus is a substantial upper conversion with spacious apartments throughout. The property benefits further from private gardens, with garage to the rear. Internally there are three double bedrooms, lounge, dining kitchen and two bathrooms spread over two levels. In summary the property layout extends to an entrance vestibule with staircase to the first floor. The formal lounge has maintained many of its original features with traditionally high ceilings, bay window and fire place. The dining kitchen is stunning with centre island display and a number of integrated appliances such as microwave, wine cooler, dishwasher, coffee machine and washing machine. The first of the three bedrooms is located on this floor and comes with fitted wardrobe, and cupboard space. The family bathroom completes the accommodation on this level, and comes complete with roll top bath, separate walk in shower, WC and WHB all finished to neutral tiling throughout. The upper level is accessed via a stunning staircase and houses two further double bedrooms, a large walk in cupboard, and a second bathroom. Externally the property has ground to both the front and rear. To the front the entrance path is lined with mature shrubs. To the rear the garden is south facing with mature shrubs, and seated area ideal for summer dining. There is a garage to the rear of the property accessed via Bellevue Lane. Park Circus is a pleasant established residential area. Ayr town and beachfront is close by and provides access to a range of amenities including supermarkets, bars, restaurants and town centre shopping. There are a number of local primary and secondary schools within the greater Ayr area.